France  2011  55m   Directed by: Raphaël Hernandez, Savitri Joly-Gonfard.  Starring: Alexandre Rodriguez, Savitri Joly-Gonfard, Guillaume Bouvet, Guy Corpataux, Florence Rodriguez, Daniel Terrier, Michel Herrero, Béatrice Ligné, Claude Chira, Joseph Bonnardel, Claire-Laurie Marchand, Coraline Marchand, Caroline Ricavy.  Music by: Raphaël Hautefort. 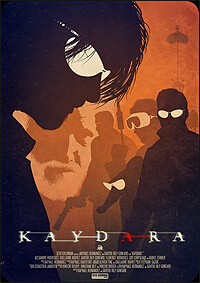 Despite the claims made in the few other (dry) user reviews, I found Kaydara to be quite a pleasant surprise. It is rather rare to see CGI and fighting choreography of this caliber in a lower-budget film. They even manage to thread in some humor without it coming off as forced. Additionally, the film offers a curiously unique philosophical viewpoint concerning the Matrix universe, which isn't offered in the original trilogy. With that last point in mind, I found the storyline to be excellent. Easily an 8 out of 10. It's obvious that the creators of this film weren't trying to cash in on the Matrix franchise, rather, they sought to offer a fresh and brand new perspective on the Matrix universe. Although, I would like to have seen more in terms of dialogue, as I feel that the concepts posed in this film are deserving of that additional attention. As I mentioned previously, the CGI was excellent as well. One really can't ask for much more than is offered here, especially considering the low-budget status of this film. I was very impressed, especially concerning the level of detail found in the ships, the ship's HUDs, and the landscapes. Their portrayal of The One was somewhat clever as well. Instead of casting some unknown Keanu Reeves lookalike, the producers decorated him via CGI and give his skin a metallic, almost mythical, look. The soundtrack and sound effects found in Kaydara were of pleasant quality as well; they complemented the visuals of the film quite nicely. The acting certainly wasn't Hollywood caliber, though it was by no means poor either, as it didn't affect the overall feel and flow of the story. All in all, I feel that Kaydara wasn't produced to cater to the masses, but rather cater to those of us who have that prevailing interest in the Matrix universe and its philosophies. If you come into this film expecting some wacky Hollywood hijinks, you'd be well advised to move on. However if you have a genuine interest in the universe of the Matrix, and its philosophical basis, this movie is a must see. Review by tommy_tt from the Internet Movie Database.